Well Culture Night is upon us. Tomorrow night, Culture Night takes over Belfast with 250+ events in 100+ venues and over 30,000 people in Belfast’s Cathedral Quarter. For me, this Culture Night is a bit special as I am actually involved! My play, “The Inn at the End of Time” is going to be part of the entertainment provided at the Black Box. 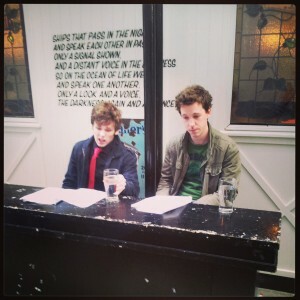 The play is a discussion in the pub between God and the Devil over a few pints. These two old friends meet up every few decades for a drink and a chat and we get to listen in to the conversation for a brief time. I wrote the play for the Black Box lunchtime theatre, where it will be performed in full next month, so its short. The run time is only about 15 minutes. The performances tomorrow will be read rehearsals more than full performances, though I have to say, having seen the guys run through this last Friday night, they are already doing an amazing job. There will be a number of shows during the day. The first is a lunchtime read through in the green room in the Black Box itself. This will be at 12:30 so if you’re about town and fancy popping in, I will be there, propping up the bar with a coffee so come and say hello. The rest of the performances are going to be outdoors in Exchange Place beside the Black Box. They will be performed at 4:30, 5:30, 6:30 and 7:30. You may even see a little cameo by me, bringing the players a pint.